The Native American people were a very cultural and spiritual group of people, and music played a big part in their spiritual lives and cultural celebrations. Two of the most prominent instruments in Native American music are the drums and the Native American flutes. These Native American flutes have a lot of mysteries surrounding their origin but they were used for many reasons in Native American culture. It is believed to have originated in the southeast and southwest of the United States. The earliest record of the flute in history among the natives was in the fifteen hundreds where they were written about by voyagers traveling the area. There have never been any artifacts found in the southeast but there are some that were found in the southwest, this could be due to many Native American flutes were made of bone and perishable materials, Either way it is well known that the flute played a big part in Native American musical history. There are many different styles of Native American flutes that have been recorded throughout history and many were seemingly developed out of whistles. Some native flutes were made out of bird bones and others were made out of things like bamboo or clay. The flutes also varied between different tribes in length and the number of holes in them. 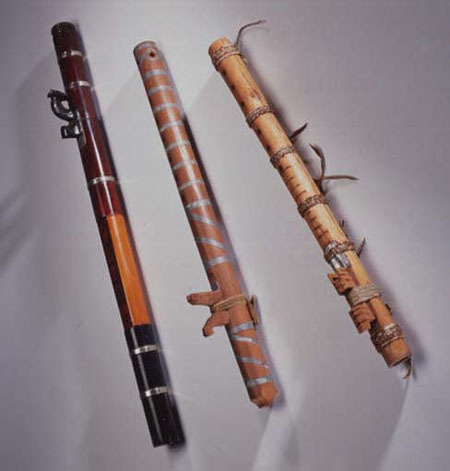 These simple Native American flutes resembled a modern day recorder. Different tribes had different uses for the flute as well. For instance the Sioux used it as a courting ritual, where a young Indian would go into the forest and create a flute to play to the squaw he desired. It was also widely used among many Native American tribes for many different meditation and tribal ceremonies. The Indian flute was also used in many prayer rituals and also in healing rituals. When the Natives made their flutes they would usually make their own and the dimensions would vary between each individual, usually judging the length but the length of their elbow to their fingertips. There are many Native flutes made by true Native Americans still today and the flute saw a huge revival in popularity in the last century.